Though it is perhaps unwise to state unconditionally that one book of the Bible is more important than another, it is true that certain books are more important than others for specific doctrines. Genesis is crucial for the doctrine of origins; Romans is crucial for the doctrine of justification. Likewise, Daniel is crucial for the understanding of eschatology. The Book of Daniel is basic for prophetic study. Mr. Roy Gingrich has carefully analyzed the main prophetic segments of The Book of Daniel – Daniel, chapters 2, 7, 8, 9, 10-12. A proper understanding of Daniel, chapters 2 and 7, and of Daniel 9:24-27, is essential to a proper understanding of Biblical prophecy, and these passages Mr. Gingrich has carefully examined. No commentary has yet achieved unanimous agreement, but this book embodies essentially the premillennial approach to The Book of Daniel. Secondly, the author has provided us with an exceptionally fine treatment of that crucial prophetic passage, Daniel 9:24-27, the prophecy of Israel’s Seventy Weeks. Not only has he examined it phrase by phrase, but he has also set his passage in the wider prophetic context of the Bible, skillfully weaving in those prophetic events given elsewhere in the bible that relate to the Seventieth Week. 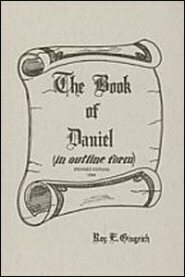 Thirdly, the author has drawn from The Book of Daniel vital, practical lessons. The events of the Old Testament were recorded for our admonition, I Corinthians 10:11, and Mr. Gingrich does not fail to apply the truth of Daniel to the heart and conscience. Fourthly, Mr. Gingrich has given to us a brief but valuable introduction to the general study of prophecy, and this introduction will repay careful study.